In his new novel, the lovers are Southerners Michael Faulk, a 48-year-old former Episcopalian priest, and the 32-year-old Natasha Barrett, an assistant to Mississippi Sen. Tom Norland. At his fundraiser, Norland introduces the two as fellow Memphis residents. After a brief but robust romance, the couple decide to marry. But before the wedding, Natasha goes off to Jamaica with her friend Constance Waverly, and Faulk heads to New York to attend the wedding of a family friend. They take those trips before Sept. 11, 2001. You can read my review of Richard Busch’s Before, During, After in the November 16 edition of the San Francisco Chronicle by clicking the image below. 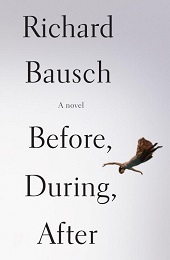 You can buy Bausch’s Before, During, After at Barnes and Noble.